There are really good reasons to use the File Geodatabase in the ESRI world over the shapefile and Personal Geodatabase, but it doesn’t mean it is easy to share. Sean Gorman knows that the more file formats he supports, the more likely people (especially GIS pros) will be using GeoCommons. I suppose the simple answer for Sean is to buy a license of FME Server and support everything and anything people upload. The cost of that solution might not make business sense just yet for him so I suppose is the lack of ESRI Geodatabase support (or any other format) limiting you when you want to share data? I like the idea of uploading a Geodatabase full of datasets at one time, but sharing a folder/file based dataset is difficult enough on a LAN, let along the internet. Is converting to shapefiles too much to ask for people who want to share data on services such as GeoCommons? 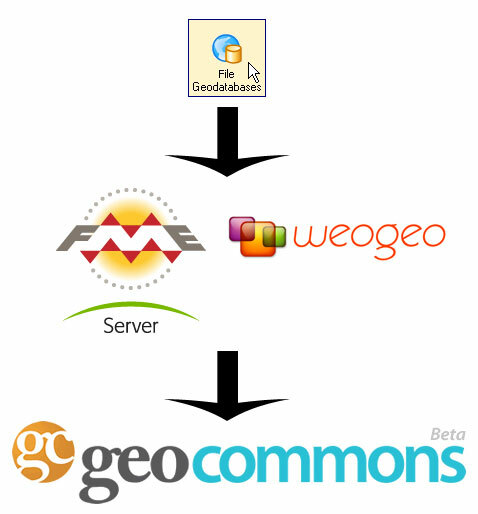 WeoGeo partnered with Safe Software to bring this kind of datasharing (among other features of FME Server) to the cloud?web so there might be solutions that are cheaper than outright licensing FME Server to bring translate capability to Web 2.0 services. If that can be coupled with Amazon Web Services pricing (pay for what you use rather than a traditional license) there could be something that many people take advantage of. And of course you could export out any layer in GeoCommons Finder! to any of the 200+ FME supported formats.